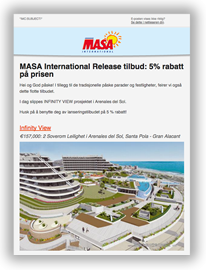 The Web site www.masainternational.de (hereinafter the “Web Site”) is owned by MASA Internacional. In the same manner as indicated in the previous paragraphs, the names of the domain “www.masainternational.de“, are exclusively owned by MASA Internacional. Misuse of the same shall entail infringement of those rights acquired by registration and shall be pursued through the means provided by Law.